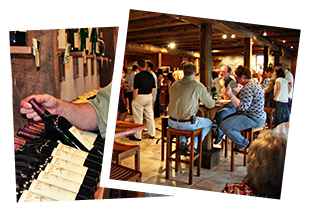 Enjoy live music in the Vyneskeller, with Steve Myers on the baby grand piano. Enjoy live music with Lou Czechowski in the Vyneskeller. Wine, beer, slushies, and small appetizers are available until 4:30pm! Enjoy live music with Michael Green on the piano. Small plates, wine by the glass or bottle, slushies, and beer available until 4:30pm. Week 2 Pairings Traminette & Flautas Two crisp rolled corn tortillas stuffed with chicken and topped with queso dip from Bethlehem's Cactus Blue, paired with Vynecrest's Traminette. All Vino in the Valley pairings will be held in our newly finished, private Cellar Experience. Non-passport holders can also enjoy some delicious offerings from Cactus Blue's food truck. Enjoy live music with Mike Spangler on the baby grand piano. Week 3 Pairings Spiced Winter White & Banana and Cream Churro Apple pie in a bottle! Enjoy the delicious hints of cinnamon and vanilla in our Spiced Winter White paired with Cactus Blue's Banana Cream Churro. Banana and cream rolled in a tortilla shell, fried and sprinkled with cinnamon and sugar. Topped with whipped cream and caramel sauce. All Vino in the Valley pairings will be held in our newly finished, private Cellar Experience. Ryan Peters playing the guitar, wine by the glass or bottle, beer, tapas menu. Enjoy live music in the Vyneskeller with Steve Myers on the baby grand piano. Small plates, wines by the glass and bottle, beer, and slushies available until 4:30pm. Week 4 Pairings Traminette & Flautas Two crisp rolled corn tortillas stuffed with chicken and topped with queso dip from Bethlehem's Cactus Blue, paired with Vynecrest's Traminette. All Vino in the Valley pairings will be held in our newly finished, private Cellar Experience. Non-passport holders can also enjoy some delicious offerings from Cactus Blue's food truck. Ryan Peters playing acoustic guitar from 1-4pm in the Vyneskeller. Wine, beer, slushies, and lite snack menu available until 4:30pm. Create a personalized gift at this 2 hour workshop! $45 per person Price includes all materials, plus a glass of wine & light snacks For more information or to reserve your spot, check out annablanchette.com No art skills required! Mike Spangler playing the baby grand in the Vyneskeller 1-4pm. Wine, beer, slushies, and lite snack menu available until 4:30. Enjoy live music by Michael Green in the Vyneskeller. Wine, beer, slushies, and lite snacks are available until 4:30pm! © 2019 Vynecrest Vineyards & Winery, Lehigh Valley PA. Website by WebTek.